Test your knowledge with the fact or myth quiz! You can use home remedies to treat toenail fungus. 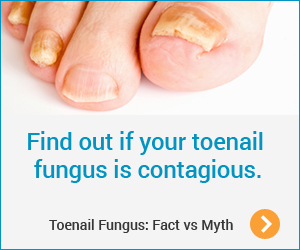 Toenail fungus is just a cosmetic problem, not a medical risk. You shouldn't expect to have fully normal nails right after starting treatment. Lasers can help resolve my toenail infection. You can't catch toenail fungus from another person. Toenail fungus will likely go away on its own. Here's the fact: Home remedies such as baking soda, white vinegar, garlic, and orange oil have little to no data to support their effectiveness in treating toenail infections. The infection can have lasting effects on the nails. Learn more about prescription treatments for toenail fungus. Here's the fact: If left untreated, toenail fungus can be painful and cause permanent damage to your nails. And if you have diabetes or a suppressed immune system, toenail fungus can lead to other serious infections. Fortunately, toenail fungus can be treated. Find out about prescription treatments for toenail fungus. It can take 12 to 18 months for a toenail to grow out. So even if you begin a successful treatment that clears up the fungus, your nail will need time to grow out. It is important that you continue your treatment for as long as your doctor has recommended. This will improve your chance of clearing up the fungal infection and minimize the risk that it will come back. Learn more about prescription treatments for toenail fungus. Here's the fact: There are some salons that offer use of lasers to "zap" away the fungal toenail infections and restore your toenail to original form. However, there is a lack of evidence to support the effectiveness of laser therapy. Learn more about prescription treatments for toenail fungus approved by Health Canada. Here's the fact: You are at a higher risk of toenail fungus if you live with someone who has nail fungus. Have other questions about your risk? Get your personalized Doctor Discussion Guide to help you prepare to visit your doctor. Here's the fact: Toenail fungus rarely goes away on its own. That's why it's so important to discuss treatment with your doctor. Get a personalized Doctor Discussion Guide to help you talk to your doctor about it.